Sakakibara Sensei was born in Handa, Japan, February 3, 1937. He trained in judo as a young man and holds a 5th Dan in judo. He began his Aikido training in August 1968, with Jon Takagi Sensei. He was awarded his Shodan by Shizuo Imaizumi Sensei July 7, 1972. In the great Aikido shake-up of 1974, Arizona Aikikai became a part of the new Ki Society under Koichi Tohei Sensei and Sakakibara Sensei received his Nidan May 6, 1975, and his Sandan December 16, 1980, under Rod Kobayashi Sensei. After Takakgi Sensei's death in February 1984, Sakakibara Sensei took over as Chief Instructor of what had become Arizona Aikido. Arizona Aikido returned to its roots with Hombu Dojo through the Western Region of the United States Aikido Federation headed by T. K. Chiba Sensei, 8th Dan. Sakakibara Sensei was awarded his 4th Dan August 5, 1986, by Chiba Sensei. In 1988, Arizona Aikido affiliated with Aikido Schools of Ueshiba and began training under Mitsugi Saotome Sensei, 8th Dan. Saotome Sensei awarded Sakakibara Sensei 5th Dan May 1, 1992, and 6th Dan January 20, 1999. 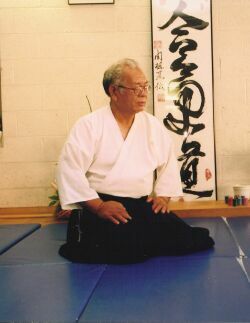 Sakakibara Sensei served as Chief Instructor Emeritus of Arizona Aikido until his death on July 22, 2013.